Sometimes, you just have to do it…..Bring in the ‘Big Dogs’. The heavies. Strong diggers for heavy bulbs. Big Dogs for the Heirloom Crinum. Now, I must say…..I’m no whimp. In the past, I did crazy things like buy an old drug house and tear it down *just* to save a 300 year old tree. I disassembled the beast and hauled it off every week for an entire year. 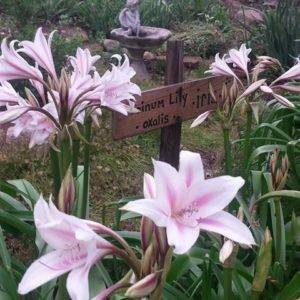 I’ve come face-to-face with an angry rattlesnake, ripped jeans jumping (falling) over barbed wire fences, and have rescued/planted/relocated thousands upon thousands of Heirloom bulbs…..but established Crinum in heavy, flood-soaked mud is different. I worked an entire hour on just one clump……and I have a day job!!! It definately was time to bring in the Big Dog. Yes!!!!! My Heirloom Crinum are saved!!!! When I arrived to the flooded house, Stan and Karalina were busy digging. Irish fiddle music was blaring as they dug, side by side. How totally adorable…..
Stan was gingerly pulling up a clump that weighed atleast 20 pounds (with compacted dirt and bulbs). I showed him how to properly divide the Crinum…. No, Stan. Don’t be delicate. You are the heavy. The Big Dog. Just use your God-given muscles and get back to work. Stan and Karalina seized and delivered about 30 large Crinum. They kept the rest of the bulbs for their new Crinum garden, which will be on an island of sorts near their large pond. A perfect place for Crinum to spread their little bulb wings and grow. I have been told by the super-team that they are going back today to “finish the job”. I like the way they think. I made sure to leave some Crinum at the flooded house garden…..Remember to mark your calender for March 9th. The free bulb dig will be open to the public at 8 am. First come first serve. (Bring your own ‘Big Dog’ to dig the Crinum!) Each gardener will receive a paper bag to dig and fill for free. Other bulbs will be available for purchase/donation. Saving and sharing the flooded house gardens before the bulldozers come. Bringing in the Big Dogs……Life is good with good garden friends, who have husbands who like to dig up old bulbs. Life is really just good with friends.